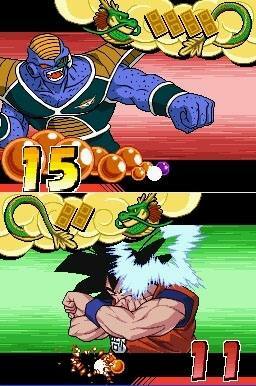 A card battle RPG featuring all your favourite Dragon Ball Z characters. Cards are marked with eight types of actions, eight power levels and eight guard levels for a total of 512 possible combinations that will determine progress. From a randomly-dealt set of five cards, players must choose which cards to use based on the eight types of action each card offers. 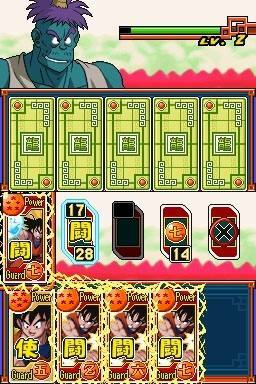 Multiple cards can be played together to power up attacks and enhance guard levels for super combos. The intensity of Special Attacks will increase as the game progresses, giving players all of the power of the DBZ universe! 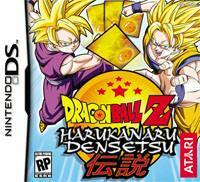 So what is Dragon Ball Z: Harukanaru Densetsu besides an extremely difficult title to type? Well my dear readers, Dragon Ball Z: Harukanaru is an exclusive card game for the Nintendo DS which is based on the extremely popular Dragon Ball Z cartoon series. Unfortunately the idea of a card game based on Dragon Ball Z may have worked well on paper, however in reality the game is a little simplistic and repetitive but this will not stop fans of the series from investigating this title. The problem most card games have is that they are extremely complex and convoluted. A game like Magic: The Gathering can't be explained just a few short sentences, you really have to sit down with it and learn the finer points that make the game worth playing. Dragon Ball Z: Harukanaru Densetsu takes a decidedly different approach that makes this the easiest card battling game you will ever play. Instead of having to learn what each card does, Harukanaru Densetsu is all about numbers and objects, something most gamers will learn within the first round of their very first fight. At its core Harukanaru Densetsu is essentially the card game War. 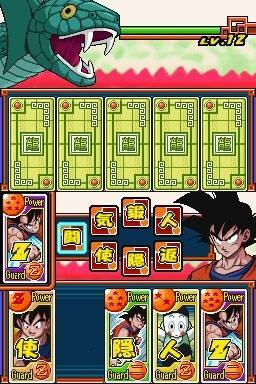 Two players battle against each other and turn over cards, whoever has the higher numbered card wins and is able to use whatever skill the card holds. Each card has a small picture of one of the character's abilities, which include fighting, running away, upping their defence, use and item, and so on so forth. Each of these cards has a number on the top, and once both cards are turned over the winner is determined by who has the higher numbered card. While there's something to be said about the simple nature of Harukanaru Densetsu's card combat, the problem is that every round seems to be determined by luck rather than skill. You don't have much control over your deck, so it all comes down to what cards are selected for you to play. All you can do is hope for the best when you select five low numbered cards, whereas by sharp contrast you're practically invincible when you have a hand of mostly high numbered cards. Most of Harukanaru Densetsu's action takes place on a large multi-path board which shows the world of Dragon Ball Z. The same deck of cards you use to battle opponents is used to walk around this map. That is, you select five different cards from your deck and use them to determine how far you can walk in each turn. Your walk distance is determined by each card's strength, so if you have a card with a five stars on it you will be able to walk five spaces. Along the way you will run into various battles, these are usually preceded by a few minutes of the most boring dialogue your eyes will ever see. Things aren't helped much by the game's lacklustre presentation. When you're moving around the board the game looks no better than a Super NES game, and the battles themselves are nothing to write home about. The only time the game ever looks somewhat impressive is when you attack your opponent, and even then the simplistic animation gets extremely old in only a short amount of time. I suppose it's too much to expect a card fighting game to have exceptional graphics, but Dragon Ball Z: Harukanaru Densetsu doesn't even try. In conclusion, I'm not convinced that a Dragon Ball Z card game would be a terrible idea, but Harukanaru Densetsu is not a shining example of what could be done with the genre. While some gamers may appreciate that there are a lot of different adventures to go on in this game, I just couldn't get into the overall experience of battling these random cards. The game play is far too simple, the stories are predictable, and the sum of all its parts never quite comes together to create a compelling portable game.